Amongst a host of new models, design concepts and technologies on Hyundai's stand at Frankfurt International Motor Show this week, one stands out. Hyundai's new high-performance N sub-brand aims to build on the South Korean company's motorsport experience and produce cars which boast performance-focused handling and aerodynamics. Albert Biermann, the Head of Performance Development & High Performance Vehicle Division commented: "By revealing this exciting high performance sub-brand N to our customers, we're challenging expectations of the Hyundai Motor brand. Drivers will soon experience the thrills and emotion of our proven motorsport prowess for themselves." He continued: "Our future model line-up will include performance-oriented and race track-capable cars that will be full of energy. These models are just the start of what we know will be a fast and exhilarating journey for our brand." As an introduction to the brand, visitors to the show are able to view Hyundai's latest motorsport challenger - the New Generation i20 WRC - and two new dynamic concepts  the RM15 and the Hyundai N 2025 Vision Gran Turismo. The i20 WRC Rally Car is under development in preparation for its debut at the FIA World Rally Championship Rally Monte Carlo in January 2016. The tough car features optimised weight distribution, greater powertrain efficiency and enhanced aerodynamic and is currently undergoing a punishing testing, engineering and development regime. The RM15 - which stands for Racing Midship 2015 - is a mid-engined, aggressively-styled coupe concept that represents Hyundai Motor's passion for high-performance and advanced technologies. 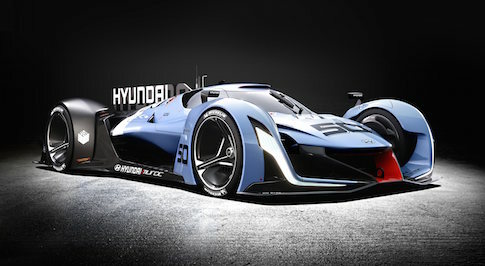 Hyundai's N 2025 Vision Gran Turismo' concept has been dubbed the 'ultimate concept car' that will show the brand's unique perspective on future performance characteristics to a global online audience. Don't forget to sign up to our newsletter to get the latest offers from Macklin Motors. A valid email address must be entered. Subscription not registered. Sorry this email address has previously been registered therefore you will already be receiving our newsletter.